When thanksgiving rolls around each year, there isn't much of a surprise what dinner might be. Colin Cowie, the host of "Everyday Elegance" on the WE network, says one great way to make a change in your celebration is to decorate and set your table differently. Cowie stops by The Early Show to share some creative ideas for the holiday. 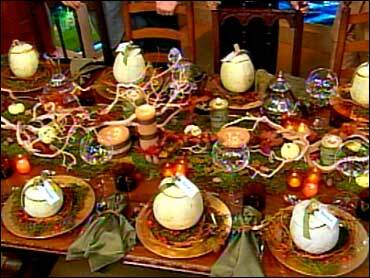 The Thanksgiving table Cowie demonstrated is an organic approach to fall and Thanksgiving. Rather than use the standard autumn-colored flower arrangement as the centerpiece, Cowie puts a spin on the holiday by using elements that can be found right outside your door -- or at least at the local market.